This new paper by Jorge Atria, Ignacio Flores, Claudia Sanhueza and Ricardo Mayer presents new findings on the long-run evolution of top income inequality in Chile between 1964 and 2015. All data series are now available from WID.world. The paper presents a historical series of Chilean top income shares over a period of almost half a century, mostly using data from tax statistics and national accounts. 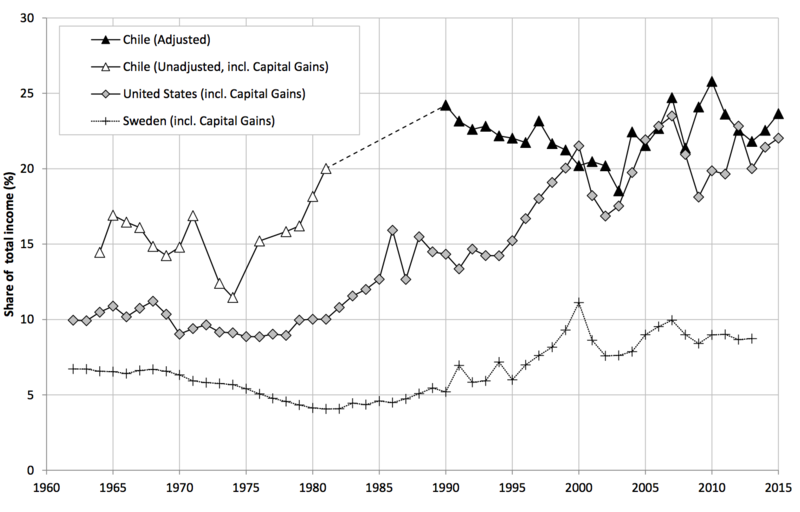 The authors distinguish between adjusted (1990-2015) and unadjusted (1964-2015) series. The latter only includes personal income, while the former includes the imputation of corporate undistributed profits, which results in higher inequality levels. Unadjusted estimates follow a decreasing trend over the course of the 1960s, followed by an inverted U-shape that reaches a peak during the dictatorship (1980s). By contrast, the adjusted series contradicts the evidence based on survey data, according to which inequality has fallen constantly over the past 25 years. Rather, it changes direction, increasing from around the year 2000. Finally, Chile ranks as one of the most unequal countries among both OECD and Latin American countries over the whole period of study.